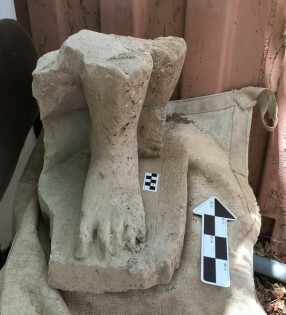 Jerusalem, July 25, 2016 — In a historic find, a large fragment of an Egyptian statue measuring 45 X 40 centimeters, made of lime-stone, was discovered In the course of the current season of excavations at Tel-Hazor, north of the Sea of Galilee in Israel. Only the lower part of the statue survived, depicting the crouching feet of a male figure, seated on a square base on which a few lines in the Egyptian hieroglyphic script are inscribed. The archaeologists estimate that the complete statue would equal the size of a fully-grown man. At present only a preliminary reading of the inscriptions has been attempted, and the title and name of the Egyptian official who originally owned the statue, are not yet entirely clear. The statue was originally placed either in the official’s tomb or in a temple – most probably a temple of the Egyptian god Ptah – and most of the texts inscribed on the statue’s base include words of praise to the official who may have served and most probably practiced his duties in the region of Memphis, the primary cult center of the god Ptah. They also include the customary Egyptian funerary formula ensuring eternal supply of offerings for the statue’s owner. This statue, found this year, together with the sphinx fragment of the Egyptian king Mycerinus (who ruled Egypt in the 25th century B.C.E.) discovered at the site by the research team three years ago, are the only monumental Egyptian statues found so far in second millennium contexts in the entire Levant. 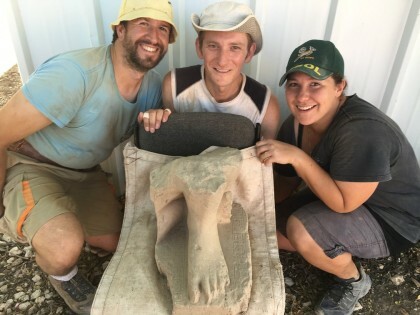 The discovery of these two statues in the same building currently being excavated by the research team, indicates the special importance of the building (probably the administrative palace of the ruler of the city), as well as that of the entire city of Hazor. According to Prof. Amnon Ben-Tor of the Institute of Archaeology at the Hebrew University of Jerusalem, who has been conducting excavations at Tel-Hazor for over 27 years, Hazor is the most important site from the Biblical period. Shlomit Bechar, a doctoral student at the Institute of Archaeology who has been excavating at Hazor for a decade, is co-director of the Hazor excavations and director of the main excavation area. In the course of close to 30 years of excavation, fragments of 18 different Egyptian statues, both royal and private, dedicated to Egyptian kings and officials, including two sphinxes, were discovered at Hazor. Most of these statues were found in layers dated to the Late Bronze Age (15th-13th centuries B.C.E.) – corresponding to the New Kingdom in Egypt. This is the largest number of Egyptian statues found so far in any site in the Land of Israel, although there is no indication that Hazor was one of the Egyptian strongholds in Southern Canaan nor of the presence of an Egyptian official at Hazor during the Late Bronze Age. Interestingly, most Egyptian statues found at Hazor so far date to Egypt’s “Middle Kingdom” (19th-18th centuries B.C.E), a time when Hazor did not yet exist. It thus seems that the statues were sent by an Egyptian king in the “New Kingdom” as official gifts to the king of Hazor, or as dedications to a local temple (regardless of their being already “antiques”). This is not surprising considering the special status of the king of Hazor who was the most important king in Southern Canaan at the time. The extraordinary importance of Hazor in the 15th-13th centuries B.C.E. is indicated also by the Biblical reference to Hazor as “the head of all those kingdoms” (Joshua 11:10). All the statues at the site were found broken to pieces and scattered over a large area. Clear signs of mutilation indicate that most of them were deliberately and violently smashed, most probably in the course of the city’s final conquest and destruction sometime in the 13th century B.C.E. The deliberate mutilation of statues of kings and dignitaries accompanying the conquest of towns, is a well-known practice in ancient times (I Samuel 5:1-4; Isaiah 11:9) as well as in our time. The Hazor excavations, which began in the mid 1950 (under the direction of the late Prof. Yigael Yadin), are carried out on behalf of the Hebrew University of Jerusalem. The excavations were resumed in 1990 – still on behalf of the Hebrew University, and the Israel Exploration Society, and are named “The Selz Foundation Hazor Excavations in Memory of Yigael Yadin”. The excavation takes place within the Hazor National Park, in full support and cooperation with the National Parks Authority. Hazor is the largest biblical-era site in Israel, covering some 200 acres, and has been recognized as a World Heritage Site by UNESCO. The population of Hazor in the second millennium BCE is estimated to have been about 20,000, making it the largest and most important city in the entire region. Its size and strategic location on the route connecting Egypt and Babylon made it “the head of all those kingdoms” according to the biblical book of Joshua (Joshua 11:10). Hazor’s conquest by the Israelites opened the way to the conquest and settlement of the Israelites in Canaan. The city was rebuilt and fortified by King Solomon and prospered in the days of Ahab and Jeroboam II, until its final destruction by the Assyrians in 732 BCE. Documents discovered at Hazor and at sites in Egypt and Iraq attest that Hazor maintained cultural and trade relations with both Egypt and Babylon. Artistic artifacts, including those imported to Hazor from near and far, have been unearthed at the site. Hazor is currently one of Israel’s national parks. The Institute of Archaeology, the birthplace of Israeli archaeology, is an independent research and teaching unit within the Hebrew University’s Faculty of Humanities. Academic programs include studies for B.A., M.A. and Ph.D. degrees in prehistoric, biblical, and classical archaeology, Civilizations of the Ancient Near East and Computerized Archaeology. In addition to its role as a teaching and training institution, the Institute is involved in major archaeological endeavors and interdisciplinary research programs. Its excavations at major prehistoric and historic sites have shaped many of the current paradigms in Israeli archaeology and contributed to a better understanding of past human behavior. For more information, visit http://archaeology.huji.ac.il.